I did it. 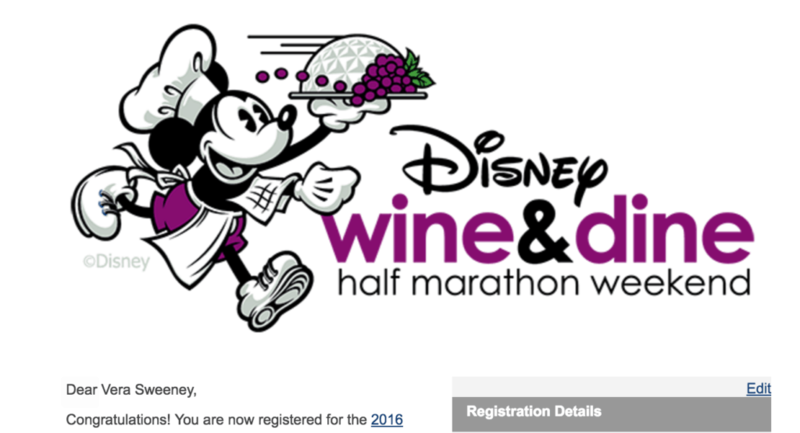 I’ve been talking about it for quite some time, but this afternoon I snagged my official ticket for the Disney Wine & Dine Half Marathon. As someone who wouldn’t run up a flight of stairs, this seems like an impossible feat. In fact, it’s quite daunting! But maybe that’s why I decided to take it on. I’m very happy with where I am in my career. My husband is a good egg. I have control of almost every aspect of my life… except one. My health. I’ve been the slow turtle my entire life. I’m a New Yorker who never owned a pair of sneakers beyond the pair she bought in high school. I’m the girl who brought Uggs on a hiking trip to Ohio and thought that was appropriate. I’m the girl who takes the elevator even if it’s only one flight up. I forgot to get the bread but I’m too lazy to turn around in the store and grab it. That’s ok… I’ll get it next time. Or I guess… that was me. A few months ago, I decided that it was time to change all of that. And of course, this decision was made right in the middle of the holidays. You know, when it was easy to eat healthy and get fit. UGH. But I joined a gym and started to work out. I DIE in EACH CLASS – EVERY TIME. It hasn’t gotten easier yet. I’m gasping for my life. I’m the one that struggles the most in each class. KNOW THIS. But I’m there… and I will be there the next time it’s offered as well. I’m slow as molasses. My mile is like 15 minutes at this point and that is me GIVING IT MY ALL. That’s me needing an asthma pump at the end. But I just started. I know I can do this. I want to take control of my body and my health. I want to be strong. I want to show my children that they can be strong too. It’s all about the commitment and the dedication towards something. I can very easily become obsessed with an idea — why not make that idea be a healthy one? So… go big or go home. I gave myself a goal and it was a GREAT ONE. The Disney Half in November is where I wanted this journey to end (or begin depending on how you look at it). I have so many people joining me on this journey. My husband for one! I JUST convinced him 20 minutes before the tickets went on sale. That was a hard sell… but he FINALLY agreed. My best friend, Audrey McClelland, came on without question! She wanted to support me from DAY ONE and I will never forget that. She has a 9 minute mile… so I have a lot of work to do! Her husband is joining us as well. We are going to have some real laughs during that race. Some local friends and some blogging friends also agreed to hop on in!! Suddenly, I have this little community that is racing together. It feels SO RIGHT. We are all going to do it together and support one another along the way. Disney does that to you! My one friend – Elpida – was going to race with us despite having stage 4 cancer. However, she just decided that it would be too much on her body to complete another half in her condition. So, I told her last night that I would run this race for her. Every step I take will be with her in mind. This race became a little bit more special to me after having that conversation. She’s such an inspiration to me and I will have her pushing me along until the end. I’m giving you fair warning – this blog is going to get ugly. It’s going to be all “marathon this” and “marathon that”. Of course, I will keep up with my fashion and food and travel. I wouldn’t have it any other way — but fitness will kick up STRONG in 2016. I hope you will join me in celebrating a healthy year and a new outlook on life. Have a good time! It sounds like a great opportunity to get moving and do it with a little Disney Magic. That sounds like a really fun event. I so wish that I could register for that! So fun! This sounds like such a fun trip! I would love to participate in a race with a fun ending like that!